Preparations for Seiland have started. Nothing physical you understand. On the contrary, I'm still sat in my lazy armchair. No, preparation at this stage of the game always involves trying to ascertain what I'm up against (terrain, weather, insects and that sort of thing) and tuning my gear list to suit. This serves several purposes. It gets me into the right frame of mind, provides me with documented proof that I need to buy some more gear and, arguably most importantly, results in my being equipped correctly for the trip in question. No two trips are the same. My pack list is always changing. All this talk of motivations for light-weighting and lightweight kit lists over at Section Hiker got me curious about the evolution of my own kit in recent years. For the last five years I've been on one main trip per year, give or take, and have kept careful tabs on what's gone in and out of my pack. Responsibilities at home have forced me to keep my trips quite short and as a result they have all taken on a very similar format: four days and three nights on the hill in summer. The data for those trips is therefore pretty clean and should reveal, rather than big swings in requirements driven by season and terrain, something more akin to a change in attitude and approach. The results shown graphically above (sorry I am after all a trained Scientist and analyse everything to death) are interesting (to me if not to anybody else). There's a pretty consistent downward trend. I'd expected an initial crash in pack weight, driven by the light-weighting bug and first energetic attacks on the big three, followed by a levelling out. 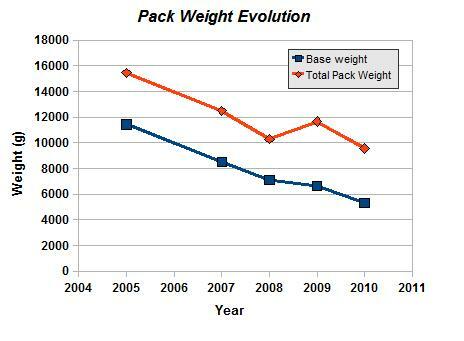 However, apart from one glitch, my pack weight, both base weight and all-up weight, continues to decrease. This can't go on surely? There are few majour purchases left to make. Any slack in the system can now only be a few grams here and there as I become more aware of what I can safely leave out? The truth is actually slightly different than the graph suggests. That Glitch was Rondane, and what you see there is that my base weights levelled out somewhat and the total weight has gone up. That's because the base weight figure is not what it seems. I don't include my photo gear in my base weight calculation. Why? Because it's non essential and on occasion I've left it at home. What the Rondane anomaly (I like that, sounds very scientific doesn't it?) shows is that, as I've eliminated dead weight, as I've pared down in other areas, I've compensated for the difference with camera gear. In Rondane I switched back to my SLR. I could because it was possible to do so and stay under twelve kilos. I'm glad I did because I've got the photos to show for it. Photos I'll keep revisiting for years to come. The last data point, my first stab at a list for Seiland, shows my base weight is down a little again. This isn't the last version, things are likely to change somewhat, the shelter will certainly be left behind in favour of a space in Randulf''s tent (motivated by bighting beasties! ), there'll be a rod and real strapped to the outside of the bag and there will be an extra days food. If, there's still any slack, my long lens my get a run out. I'm willing to bet that all those swings and roundabouts will see me back at around twelve kilos on the first day. Things are probably levelling out after all. That's good. That's a weight I'm happy with. That's a weight I can function under. And, at the end of the day, that's what's important! God, let's keep the 'expenditure against weight saving' analysis under wraps yeah?! No fear Joe. The secrets safe with me! You've done well! My very first kilograms shed cost a fortune (Cumulus down bag, Montbel down inner, MLD tarps etc all flown half way around the world). I've wiped all that out with a kilo of camera now though so the card keeps coming out to compensate. It gets worse. I was disciplined enough to take one lens last time out(14-42mm Zuiko kit lens). Now I'm getting more familiar with it I realy don't want to leave my 40-150mm at home. Take my big zoom though and I'll definately want a tripod? Come to think of it, if I take my big lens and a tipod I might as well pack my 25mm pancake right? And so on ad infinitum...... One saving grace is that the Zuiko kit lenses, being plastic, are very light.